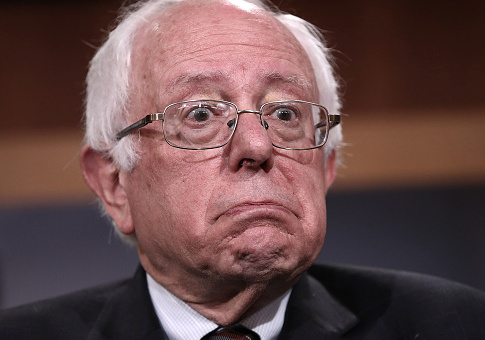 South Carolina Democrats are expressing displeasure about an upcoming visit by Sen. Bernie Sanders (I., Vt.) amid fears the self-described socialist's message will prove too extreme and off-putting in the ruby red state. On Wednesday, only one day after Sanders announced he would be hitting the campaign trail for Democratic candidates on the ballot this year, high-ranking members of the South Carolina Democratic Party made it known that not everyone welcomed the senator's visit, the Associated Press reported. Amanda Loveday, a former executive director of the South Carolina Democratic Party, indicated that Sanders' decision to journey to South Carolina ahead of the midterms struck her as "selfish," especially as the senator is speculated to be weighing another run for the White House in 2020. While the senator is scheduled to campaign for both House and Senate candidates alike between now and election day, his appearance in South Carolina on Oct. 20 is on behalf of Our Revolution, the advocacy organization that spun off from his failed 2016 presidential bid. On the date in question, Sanders is slated to be the keynote speaker at a "Medicare for All Rally" hosted by the organization. The views espoused by Loveday and other members of South Carolina's Democratic leadership underscore the issues that hampered Sanders' previous presidential bid. During the 2016 Democratic presidential primaries, Sanders' spirited challenge to former Secretary of State Hillary Clinton caught fire in the early primary states of Iowa and New Hampshire, where the senator posted impressive showings. Democratic heavyweights dismissed Sanders' early momentum as fueled mostly by "young white liberals"—a description utilized by then-Labor Secretary Tom Perez in leaked emails to Clinton staffers—and argued his campaign would fail to gain traction in states with heavily minority populations. The speculation of a built-in firewall in the South, where African Americans accounted for a large portion of the primary electorate, that would prevent Sanders from seizing the nomination was proved accurate in South Carolina, where Clinton bested the senator by nearly 50 percentage points. Despite Clinton's blow-out in the primary, the former secretary of state lost South Carolina to President Donald Trump handily in the general election. The animosity towards Sanders in South Carolina, however, seems to extend past primary battles and into fears the senator's presence so close to election day could damage Democratic efforts to make inroads in the heavily conservative state. Boyd Brown, a Democrat who previously served in the South Carolina House of Representatives, asserted that the senator's views were not likely to resonate and could even backfire. Sanders' planned visit to South Carolina comes as incumbent Republican Gov. Henry McMaster has increasingly invoked the Vermont socialist in relation to his Democratic challenger, James Smith. In recent ads, McMaster has lambasted Smith, who has been endorsed by Our Revolution, as a Sanders-style progressive who will raise taxes if elected. Smith has attempted to deflect the attacks by pointing out that he'll need to govern in a bipartisan fashion if elected, given the overwhelmingly Republican majorities in the state legislature. This entry was posted in Politics and tagged 2016 Election, 2018 Election, 2020 Election, Bernie Sanders, Democratic Party, South Carolina. Bookmark the permalink.